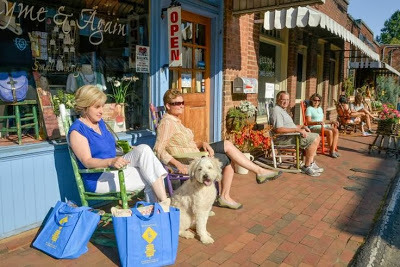 Black Mountain, a ridiculously adorable small town just east of Asheville that’s chock full of locally-owned shops and restaurants, is currently raising funds for renovations to its Town Square. The Black Mountain Town Square is located right in the heart of downtown Black Mountain and plans are to transform it into a gathering place for the community and visitors, with an open lawn for outdoor concerts and other outdoor events, extra parking (always nice in a small town that welcomes a lot of visitors each year), and space for farmers’ markets and special events. The fabulous painted rocking chairs will be auctioned off between noon and 2pm on Saturday, October 19, 2013, at the Town Square (corner of State St/Hwy 70 and Broadway/Rt. 9), with proceeds to benefit the Black Mountain Town Square Project. 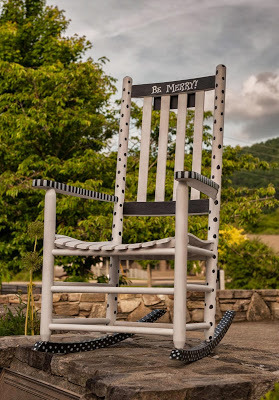 Click here to see the gallery: www.thelittletownthatrocks.com/index.php?page=chair-gallery-2. This entry was posted in Uncategorized and tagged art, Black Mountain, festivals and special events by Inn on Mill Creek. Bookmark the permalink.